Emotional states and the act of managing them seems to be one of the key tensions in this thing we call human experience. We have a built-in capacity it seems to cover our anguish and turmoil with a coating of contentedness, a patina of pleasure, a veneer of vitality, and yet very often on the inside, we’re full of doubt, worry, insecurity, and an impending sense of doom. Well, don’t think that songwriters have overlooked this dynamic in human experience. Oh no. There are plenty of songs out there that can be counted on as bitter pills coated with sugar. This is not to say that they are necessarily mocking, or are in some way disingenuous, although some of them are. After all, all of that is a part of life too. But, here are ten jaunty tunes of doom, ten ditties of delightful destruction, ten anthems of anguished despair that proves the grand greyscale of our existence is not so lonely, knowing that we all appreciate the irony of a disaster you can dance to. This is a macho guy’s anthem in many ways, taken from their 1961 album named after it, The Wanderer. This is the tale of an itinerant ladies’ man who is with a different girl, or group of girls, every night. Which one does he love best? His tattoo, man – Rosie on his chest. Nothing can touch this guy. When love rears its head, he hops back into his car and he’s gone again. But, there’s the rub. This doesn’t happen when women fall for him; it happens when he finds himself falling for one of them. To me, this is where the macho womanizer tale ends, and where the lonely soul who is frightened of love begins. 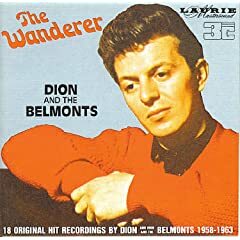 Ultimately, this song is one of the most tragic of the period, even among all of the teen death ballads that were out around this time when Dion & the Belmonts recorded this. Dion’s own story is also a tale of the seemingly happy, together singer who had a dark secret – Dion struggled with heroin addiction. Luckily, he managed to shake it, while recording some critically acclaimed folk-rock albums by the end of the decade, and finding religion in the next. One of the most joyous sounds to me is the combined voices of Lennon and McCartney on some of those early Beatles sides. This tune, taken from the 1964 album Beatles for Sale , is a great example of what great singers these guys were together, with John’s lower voice anchoring the melody while Paul soars above him. Without listening to the words here , the song could be about rainbows and unicorns. But despite the sweetness of the voices, this song is all about trying to woo a widow, a woman caught up in the despair of her loss. And more, it’s about the feelings that arise from her would-be lover, that she is wasting away, denying love in exchange for a memory. To me, it’s one of the most sombre tracks the group ever recorded. And yet those voices – aural honey! One of the things which amazes me about the Beatles is their maturity as writers even very early in their songwriting careers. It’s been written many times that at some point, they stopped writing for teenage girls and began writing for themselves and their peers. But, where does this one fall? It’s not really a teen death song because there’s no romanticism in the death spoken of here. The tragic event is implied more so than directly described. There’s no romantic tragedy here. There’s just two messed up lives, both pining for a love that can never be returned. A few years later, Lennon had kept what he’d learned about making the words work against the melody of a song in order to create a jarring effect. And on this cut, taken from his landmark 1971 solo album Imagine , is a prime example of his dark humour, and his prowess in using a good-time melody and style against his own sobering views of inner turmoil. Since John knew a lot about both great melody and dealing with lifelong demons, it probably made some sense to him to put them together. The song was allegedly about an acquaintance, yet it’s hard not to apply the message of the song to Lennon himself, who had by this time made the subject of his own anguish something of a favourite when he approached songwriting. Lennon had spent many years as “Beatle John”, one of the lovable mop-tops, never without a quip or a mug for the camera. And yet the death of his mother while he was still a teen, and his feelings of abandonment surrounding his absent dad from early childhood were dark feelings he could barely conceal even at the height of his popularity. In 1965, he’d written “Help!” which is a child’s cry for love and attention in the guise of a catchy pop song. By ’71, he was writing from this vantage point with a level of self-awareness which he may not have been at liberty to demonstrate at the height of Beatlemania. Yet, still he struggled. I’d like to think that if he’d lived, he’d be at peace with his past by now. After all, he’d done his therapy and recorded it for posterity. Much has been written of the New York death; that is, the death of someone who is not discovered for weeks and months, due to how disconnected and anonymous that person was in a bustling metropolis. There is further tragedy heaped upon this sad situation when the person in question once dominated the limelight, and had in fact been celebrated as a star in their field. Such was the fate of silent screen actress Marie Provost (actually spelled Marie Prevost), sidelined by the advent of sound in movies, and destined to die penniless in her New York apartment, only to become “a doggie’s dinner” to her pet dachshund post mortem. 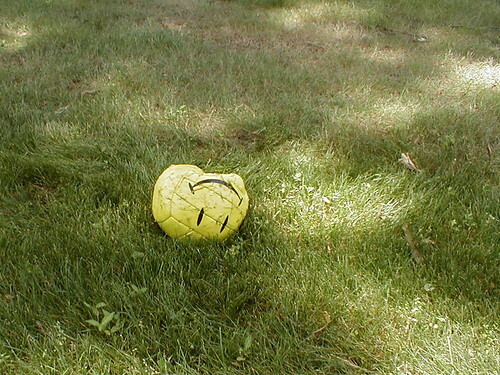 A ghastly tale of tragedy and gore, right? Sure. 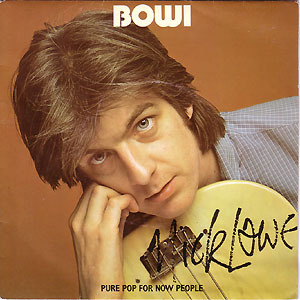 But in Nick Lowe’s 1977 song taken from his Bowi EP (so named in answer to David Bowie’s Low album…) and later featured on the compilation Basher: The Best of Nick Lowe , you’d think that this was a bouncy, happy-go-lucky 60s pop throwback, with chiming guitars and twinkle-in-the-eye vocal delivery to boot. But this is a song about the empty and transitory trappings of fame, a weighty subject. Yet you can practically hear the smile on Nick Lowe’s face. Lowe understands and employs a classic angle in pop songwriting; using the contrast between lyrics and melody to drive the delivery of the song, which is ultimately a sad tale told with ironic jubilance. In Britain at the beginning of the 80s, things were not looking too good for traditional industry. And because of that, the industrial centers of the country suffered lay-offs, long-term unemployment, and thousands and thousands of people “on the dole” without anything to really define their purpose in life. Racial tensions were on the rise, and street violence was common. At the same time, the music of the Caribbean had made cultural headway in the area too, particularly reggae and its early progenitor ska, both of which had been the answer to the joyfulness of Tamla Motown as interpreted by musicians from the islands. It is party music, music to dance to, to use as a means of celebrating life. British musicians, including first and second-generation immigrants from Jamaica, St. Lucia, Barbados, and other Caribbean islands, took the celebratory nature of ska, and mixed it with the sneering dissatisfaction of punk. And songs like “Nite Klub” from one of the premier proponents of the scene, Coventry’s The Specials, typified the spirit of the times. 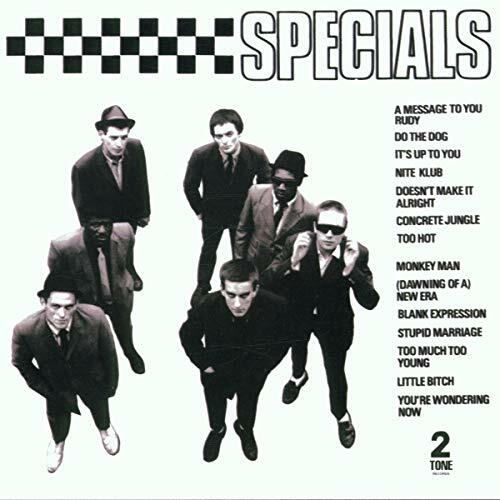 This tune, taken from their 1979 debut The Specials, portrays the emptiness of nights out while facing the crushing economic pressures of having no job and depending on government money to survive. Yet, with the bright tones of the horns and the bouncy energy of the rhythm section, at least this is social marginalization that you can dance to, right? As was pointed out in an article about Kraftwerk I wrote recently, there is a tension running through the music of the futurist pop that sprang up at the beginning of the 80s. The tension is about looking forward to the future and dreading it at the same time. Medical science and the leaps and bounds that were (and are) being made were a concern as much then as they are now. This is so much so that it filtered very easily into pop culture, and onto the charts. Alvin Toffler’s book Future Shock had been a popular bestseller for a decade, and everyone who had their minds on the role of technology in society seemed to reflect this duality, this longing for a bright future mixed with a fear of the unknown, and possibly a deep-seated mistrust in the moral basis upon which a lot of technology was being developed. The question seemed to be: are we moving into the future too fast for our society, and individuals in that society, to manage? Perhaps not much has changed, but for the question which is perhaps unasked all too often. It’s easy to forget that the brains that invented digital technology which has come to define our world, are arguably no more wise than those who wage preemptive wars with countries who have done us no direct harm. OMD’s “Genetic Engineering” from their 1983 album Dazzle Ships expresses this is a roundabout way. To me this is like a children’s song, or an advert, except for the menacing drone of the music against the shiny, happy melody line. And then of course there are the lyrics “These are the lies they tell us/the future’s good as sold/In all the things we do and know, we really must be told.” Suddenly, after pushing through the chirpiness of the melody, we realize that this isn’t the ode to salvation through science it seems to be. It’s a propaganda piece, with a hint that the future is a place where all things are controlled – yet by whom? Families are almost never what they seem. And yet there is often pressure on them to project a certain image to others that the family in question is normal, healthy, and fit to stand as an example to other families everywhere. I suppose there is a good side to this of course; it’s always good to aspire to an ideal, just as long as that ideal is not thought of as reality. Because in every family, there are secrets big and small. Some are unexpected in a good way; that Grandma once backpacked through Europe when she was a girl. Or that your uncle once played bass in a pickup band for a one-off Chuck Berry show in 1973. But some secrets are so dark, so unspeakable, that they remain to be a hovering spectre over a household that dare not explore it or deal with it. This is what we’ve got here, I believe. 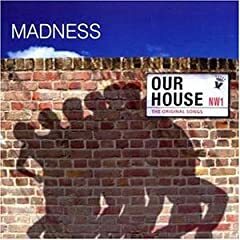 Just as their “House of Fun” single is not about going to a carnival, Madness’ sole 1983 North American hit “Our House ” is not what it seems either. In this tune, we get the portrait of the mundaneness of a family, of a sister sighing in her sleep, a brother who’s got a date to keep, about a house-proud Mum. This is all well and good, except for the throw-away line buried between the verses: “Something tells you that you’ve got to get away from it.” Suddenly, there are other forces at work in this tune, with the veneer of normality and even dullness scratched away just a little bit to discover dissatisfaction and negativity underneath. They say that life is all about the journey, and it’s certainly been depicted that way in popular literature from Pilgrim’s Progress, to On the Road, to Dude, Where’s My Car?. I think that one of the main drives behind this idea is the hope that life is intrinsically meaningful, that it is in fact going somewhere. Whether this is a place, as some religious orders and traditions hold, to a certain state of mind, or to some technological and entirely rational future based purely on the merits of human achievement is almost beside the point in these terms. But, what if life is just a series of events linked together randomly, with nothing but cause and effect as its only source? 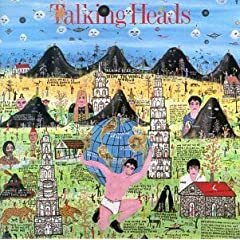 This is what I get from this 1985 Talking Heads song, taken from their album Little Creatures . The music is almost a tent-meeting gospel singalong track, in the traditions of the timeless church hymn “I’ll Fly Away”. But, the song has a message which could be construed as being entirely opposite. What with the concepts of American manifest destiny, the Second Coming of Christ, and Star Trek fantasies of a harmonious world government and an end to hunger and poverty in the future, our culture seems to be clinging to the hope that things will work out in the end. With this song, the jauntiness of the tune seems to hint, rather ironically, that no future is guaranteed but for the present times which will shape and define it. Love – the two-edged sword. It can make you, or entirely ruin you. Of course, love has been the subject of popular song for centuries, and I imagine too that heartbreak hasn’t changed all that much over the course of time. With the advent of heartbreak of course come a myriad of other emotions, exploding outward like shrapnel from an emotional epicenter. Among those comes desperation, delusion, and the distortion of one’s self image, defined forever (or seeming to be) by a damaged connection to one who doesn’t return the sentiment. How do you make a perky pop song about that, exactly? Well, it’s been done numerous times. The Cardigans’ 1996 hit from their album First Band on the Moon , “Lovefool” was such a song, with the chirpy backing vocals and bouncy rhythm, all aiding and abetting lead singer Nina Persson’s plaintive vocal of someone who will settle for the pretense of love instead of the real thing, just to remain with the one she adores. The tragedy of that proved to be an infectious dance groove by the middle of the 90s, perhaps fueled by the universality of the scenario. And as above, what better way to expunge the feelings of worthlessness than by singing and dancing about it and to it? If the origin of the blues can be traced anywhere, then surely that place is here. This song was used effectively on the Romeo + Juliet soundtrack album, brightly bouncing along to arguably the most tragic love story there is. One of the most frightening sounds is the ring of a phone early in the wee hours of the morning from loved ones far away. Phone calls like that, unless someone is expecting a baby, are almost always bad news of the worst kind. It means someone is dead, doesn’t it – or at very least in the drunk tank. But think of the life of the internationally traveled musician, finding themselves in all time zones for large portions of the year while life happens for their families and friends at home without them. The chances of such wee-hour phone calls expand exponentially. And as a result, the news and the experience of finding out the news, filters down into songwriting. This is what happened with Neil Finn while touring with his brother Tim. His friend and former bandmate Paul Hester had been found dead near his home in Australia, and Finn was in England. In times like that, there really is nothing to be done, and particularly when in another country. So, the song “She Called Up” , taken from the group’s 2007 album Time on Earth is a tale of bad news, sadness, and helplessness, all to a blithe backing and even “la la la” backing vocals which Hester probably would have appreciated. And this is just the thing. With all of the tragedy, the song that came out of it was true to the memory of the one who’d passed, known as he was for his onstage banter and clownish demeanour. This is a wake of a song, rather than a funeral. And it points out that there are many ways to mourn, many tones in the emotional paintbox to help one grieve the loss of a friend. When in music class at school, we learned to tell the difference between major keys and minor keys in terms of happy and sad; major was positive sounding, happy, triumphant, while minor keys were blue, morose, sad. As we got older, we became more aware of the complexities of emotional states. And while those first impressions still ring true to some extent, we know that something as wonderful and dangerous as emotions and the experiences which provoke them aren’t always so cut and dried. And because it is the stuff of the lifeforce, music follows suit, acting like a medium to communicate complex ideas to millions of people using simple tones to unlock new possibilities and new connections, whether they be good tidings or bad. It is because of this that a dirge can make us aspire to greatness, while the sweetest ode can allow us to see the greatest sense of grief. What about LDN by Lily Allen?